The pursuit of social justice is an important part of NMAI’s mission, and we work towards it in many ways. The most visible means of addressing issues of prejudice, racism, and injustice are public programs such as our symposium on racism and sports mascots or Nation to Nation, our major exhibition about treaties and sovereignty. But perhaps the most enduring and transformative moments of change at NMAI are quite small and intimate. Native visitors to our collections often share with museum staff memories of their ancestors in photographs or knowledge about how an object in NMAI’s collection was made or used. This information is entered into our collections database and becomes part of the object’s catalog information. This sounds like mundane museum work, but in fact this personal, family, and community knowledge is crucial for transforming how the history of the Native people of the Western Hemisphere is told and studied. And that transformation – from a “museum-voice” narrative about Native Americans to a collaborative narrative by Native Americans – is at the heart of NMAI’s social justice mission. I was fortunate to have an experience last March that beautifully illustrates how personal knowledge can change the narrative of history. Several visitors representing the Poeh Cultural Center (PCC) at Pojoaque Pueblo were at NMAI’s Cultural Resources Center to participate in a conservation workshop for our Community Loans program. Through this initiative NMAI is working collaboratively with the PCC to loan 100 ceramics representing the pueblos of Pojoaque, San Ildefonso, Santa Clara, Nambe, Tesuque, and Ohkay Owingeh. The PCC representatives were at NMAI’s CRC to discuss and make decisions about the conservation treatments of the ceramics with collections and conservation staff. 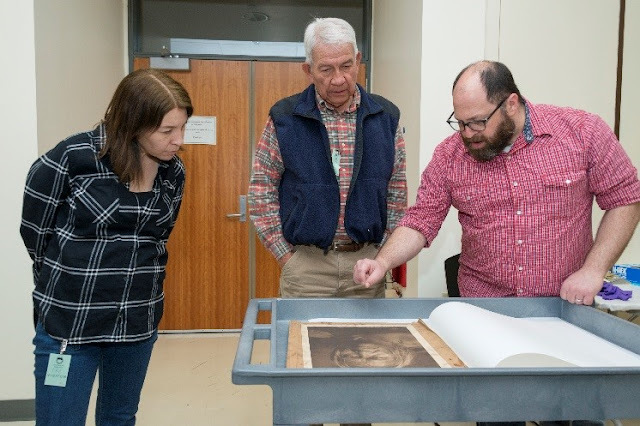 The workshop demonstrates something fundamental about NMAI’s thinking – while our curators, conservators, archivists, and other staff are extremely knowledgeable, we are not the only experts. The people who make, grow up with, and live within the cultures that create these objects, such as Tewa pottery, have deep expertise. NMAI staff are aware that we have much to learn from the people whose cultural heritage it is our privilege to steward. Among the community scholars, artists, and museum professionals who came to the CRC for this visit was John Garcia, a citizen of Santa Clara Pueblo and a remarkable individual who already has years of experience working with NMAI. He was a community curator on NMAI’s inaugural exhibition Our Universes. Mr. Garcia has played a major role in reintroducing traditions to Santa Clara Pueblo that had not been practiced in decades. If all of this wasn’t enough, he’s one of the kindest and most friendly people one could ever hope to meet. 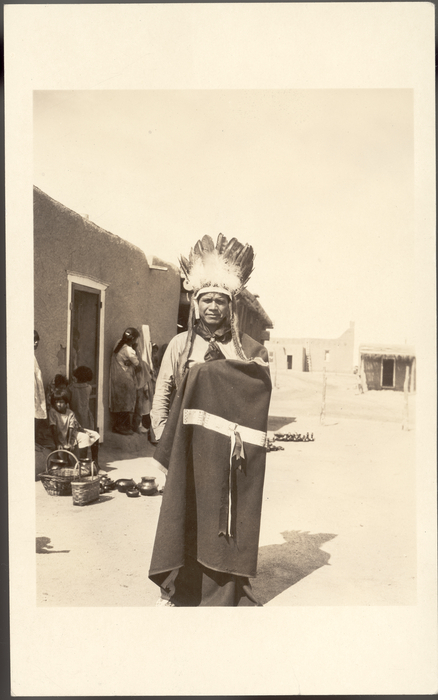 As is the case with most Native visitors to the CRC, the staff of NMAI’s archives offered to run database reports of photographs for our guests. I was handing Mr. Garcia a report of the Santa Clara Pueblo photos in our collection when I overheard him discussing Edward S. Curtis with another NMAI staff member. 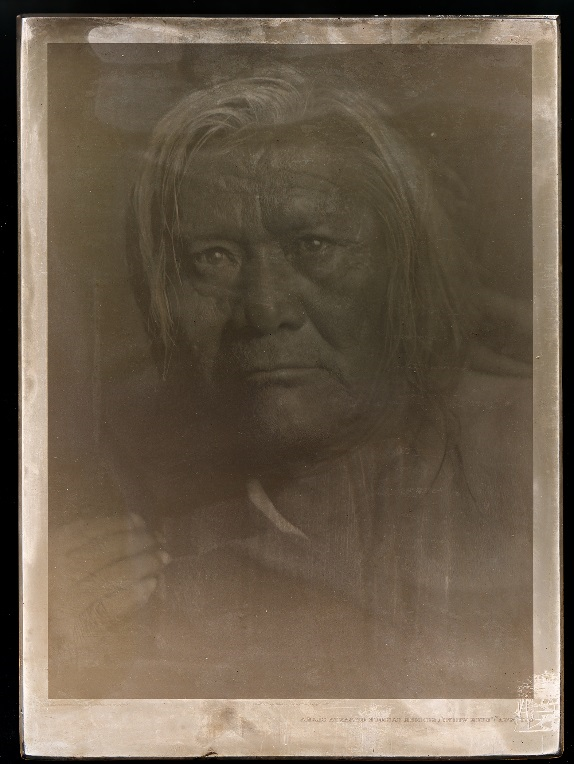 This caught my attention because NMAI has an important collection of unique Curtis photogravure plates and proofs. These plates were used to print the many copies of Curtis’ massive 20 volume Indians of North America. Hopefully without sounding too nosy I asked how Curtis came up in their discussion, and Mr. Garcia said that Curtis has photographed one of his ancestors. The possibility of NMAI having the printing plate and proof of this photo was too exciting to pass up, even if the likelihood was low. Our collection of 184 printing plates is less than 10% of the total number of images in Curtis’ huge publication. But it was worth a look. I will forever be so glad I stumbled into that conversation because not only does NMAI indeed have the printing plate of Oyi-tsa (or Duck White), Mr. Garcia’s great-great-grandfather, we have the big, folio-sized plate. And we have the accompanying proof – the very first print made from the plate. Edward S. Curtis photogravure plates and proofs for The North American Indian, Box F42.National Museum of the American Indian, Smithsonian Institution. Photo by NMAI Photo Services. 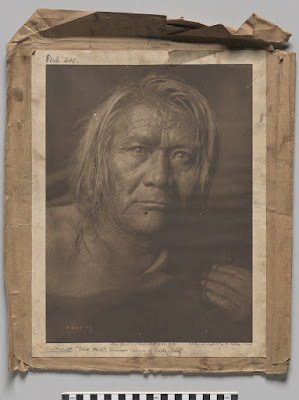 Edward S. Curtis photogravure plates and proofs for The North American Indian, Box F42. National Museum of the American Indian, Smithsonian Institution. Photo by NMAI Photo Services. The only thing more exciting than finding these photos was sharing them with Mr. Garcia. He had, of course, seen the photograph before, but did not know about the photogravure process. Seeing the unique printing plate, and the proof print was clearly a very special experience for him. Left to Right: Lynda Romero (Pueblo of Pojoaque), Poeh Cultural Center Assistant Director of Programs, John Garcia (Pueblo of Santa Clara), and Michael Pahn discussing the proof of Edward Curtis' photograph of Oyi-tsa, March 2017. 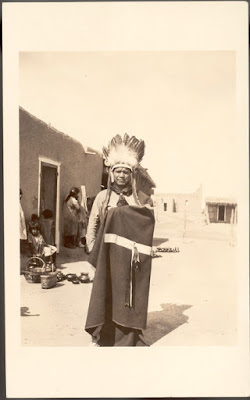 Photograph by NMAI Photo Services. What came next, however, is the most exciting and most enduring part of this very special shared moment. 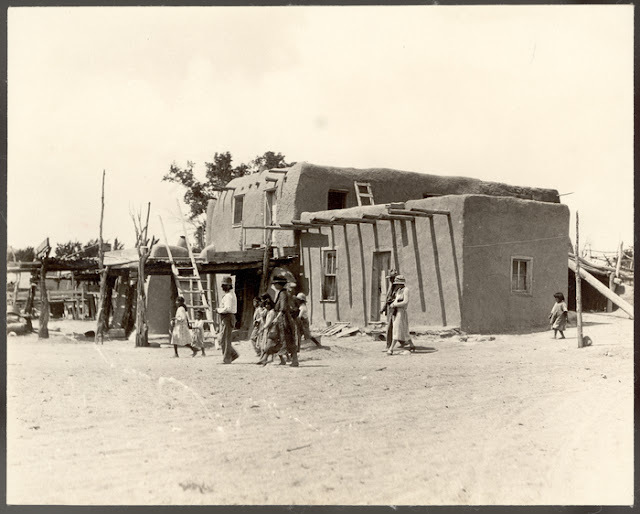 Mr. Garcia talked about Oyi-tsa – how his family remembered him, that his baptized name was Jose Maria Naranjo, that he was the cacique, or leader, of the Santa Clara Pueblo’s summer moiety. Even by the time Oyi-tsa was cacique the leadership of the Pueblo had transitioned to a governor-based system. But the cacique was still an important ceremonial position, and one that a person was appointed to for life. Oyi-tsa served for an unusually long time – about thirty-five years – until his death in 1917. Mr. Garcia noted that many of Oyi-tsa’s descendants have honored his legacy by serving in leadership positions in the tribal government to the present day. Mr. Garcia next flipped through the database report of photos I had given him earlier and told us about how other photos in NMAI’s collection were connected to Curtis’ photo. This is a photo of Oyi-tsa’s house, which is still standing. The two story section is the original building. National Museum of the American Indian, Smithsonian Institution. P07082. Photo by Charles Morgan Wood. This is a photo of Salvador Naranjo, Oyi-tsa’s son. Pictured with him is his first wife, Perfilia Naranjo. Salvador Naranjo’s second wife, Celestina Tafoya, was a noted pottery maker from a family of noted pottery makers. There are many vessels in the collection of the NMAI that were made by members of the Tafoya family. National Musuem of the American Indian, Smithsonian Institution. P26018. Photograph by Ethel S. Tichenor. And this is Cleto Tafoya, Oyi-tsa’s grandson, Salvador Naranjo’s nephew, and John Garcia’s grandfather. His parents were Juan Pablo and Clara Tafoya. While John Garcia’s father was serving in the South Pacific during WWII and his mother was working to support the family and the Home Front, he was raised by Cleto Tafoya. National Museum of the American Indian, Smithsonian Institution. P07747. Unidentified photographer. I can’t overstate how exciting it was to learn all of this new information. 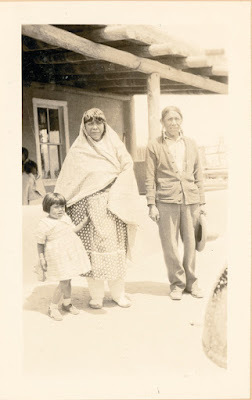 Mr. Garcia’s deep personal connection to the photograph of Oyi-tsa and knowledge of his family’s history revealed relationships between photographs and objects in our collection that NMAI staff could never have made on our own. Now that information will be available to researchers because it will be part of the catalog records for these materials. This is how we are changing the way history will be told in the future. Typical Western scholarship looks to cultural institutions like the Smithsonian to be the authorities on the past. Mr. Garcia, and all of the many other Native experts and scholars who have contributed their knowledge about the collections we steward, are helping to set the historical record straight by putting their Native voices where scholars – non-Native and Native alike – look for authoritative information. It is impossible to reflect on this moment with Mr. Garcia and the photograph of Oyi-tsa without taking into account the legacy of Edward Curtis. While he did often record the names of the people he photographed, Curtis was not really depicting his subjects as individuals. Through his photos, they became abstractions or archetypes of the “noble savages” that supported the narrative of the dying race that Curtis and much of the field of anthropology was promoting in the early Twentieth Century. This is a topic that NMAI has explored at length in past exhibitions and publications. Anonymity is powerful tool of racism. Stereotypes work when all members of some group are thought of as being essentially the same and individuals are stripped of their unique identity and character. This abstraction allows prejudices to take root. Consequently, the personal remembrances that NMAI’s visitors share are much more than charming stories. They return individuality to the people documented in our collection. They transform images of archetypes into pictures of human beings. History is ultimately the stories of human experiences, good and bad. By providing the historians of the future with greater context and detail about the Native people – actual people – of the Western hemisphere, the histories they tell will become increasingly just. I am so excited to see this photo of Salvador & Perfilia Naranjo. My mom, Theodora, was their daughter and I am wondering if there is a date with this photo? I am hoping that the little girl in the photo is my mom. As far as I know this is the only photo I have ever seen of Perfilia and my grandfather, Salvador, passed away before I was born.